Whereas, it is ontologically impossible for anything to come from the emptiness of Nothing, it is logically sound that all Somethings come from the fullness of Everything-Nothing. When fullness is taken from fullness, fullness still remains. In mere moments of curious consideration, though, these oppositions melt into paradox. When my daughter was about 16, she asked, “Mom, what’s the difference between everything and nothing?” “Indeed!”, I exclaimed. A smirky, raised shouldered “Huh?” followed. I clarified, “To have asked this question tells me you already know the answer!” With that, she nodded and left the room. Everything-Nothing is never quantized. No quanta exist there; it is the realm of sub-quantum potentiality. 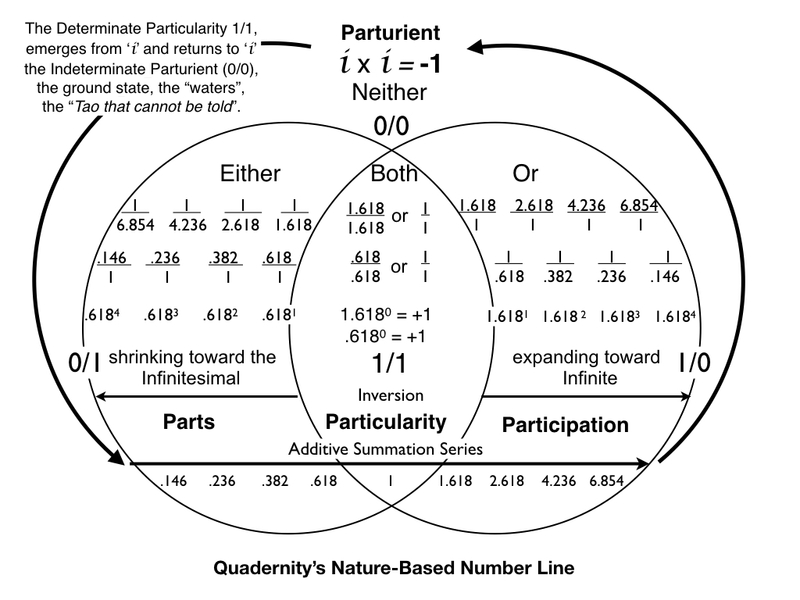 Our new number line, brought forward from the previous chapter and reprinted below, includes an entire countable infinity, spanning from the infinitesimally small to the unimaginably large, all without reaching absolute Nothing (0/1) or absolutely Everything (1/0), the boundaries of the Pragmatic Schematic. Look, it cannot be seen — it is beyond form. Listen, it cannot be heard — it is beyond sound. Grasp, it cannot be held — it is intangible. These three are indefinable; therefore they are joined in one. From above it is not bright; from below it is not dark: an unbroken thread beyond description. It returns to nothingness. The form of the formless, the image of the imageless, it is called indefinable and beyond imagination. Stand before it and there is no beginning. Follow it and there is no end. Stay with the ancient Tao, move with the present. Knowing the ancient beginning is the essence of Tao. The ten thousand things are born of being. Being is born of not being. The enigmatic formula seemed at first to give us Something from Nothing; however, we now understand that the ten thousand Somethings that come from Being were ultimately sourced by the Not Being, the Everything/Nothing.